When I was a child, I had a pair of favorite mittens and matching hat that were thick and warm and had cute little puffs in the stitch pattern. I have always wanted to duplicate those pieces. Here is my interpretation of them in grown-up versions. 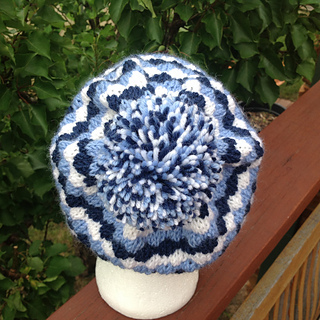 This slightly slouchy hat, is worked in the round in an easy-to-knit textured pattern. 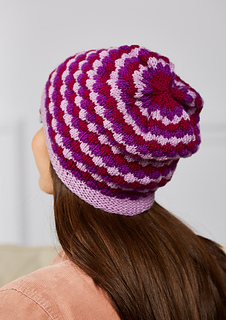 Interlocking diamonds are created in wide stripes of color with a Tuck Stitch knit into the stitch several rounds below the needle while releasing the stitches above. Only one color is used at a time. 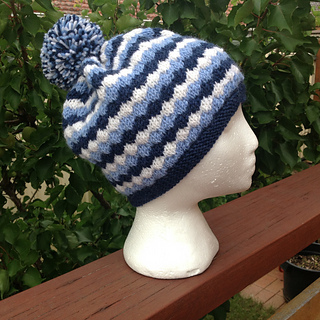 Use three colors for stripes as I have here, change it up by using only one or two colors or make it multi-colored by using up your scraps. Yarn colors – 1766 Orchid, 1530 Crocus, 1765 Cerise.